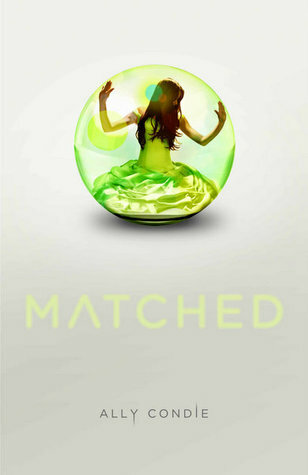 Review - Matched is the new shiny dystopian that is getting everyone foaming at the mouth. Its cover is a work of art and it manages to combine dystopian sensibilities with an over arcing romantic storyline, basically it is right in the pocket of the YA market. Unlike many mass hyped, beautifully wrapped YA tales of three teens trapped in a romantic tangle, this novel is beautifully written. Condie has a way with words and that is very clear from the first page. This flows into the vast planning necessary for this dystopian world to exist. Like many other bloggers have pointed out, the word building that takes place here is on par with that of Lowry's The Giver (I would hazard to say even more so.) There has been so much thought put into the way in which this world operates and how it would effortlessly intertwine with the narrative that it is easy to be impressed. And yet this is also my problem with the title, the world consumed so much of my attention and emotion that the protagonist seemed flat. My anger was for all citizens, that there choices, their freedoms, their life expectancy were limited to what probability could assign them. My feelings for that of Cassia should have been tenfold instead of equal. The protagonist, Cassia, is the ultimate milquetoast in that she has been brought up in a system that ensures citizens tow the line without thought. She's largely passive unless otherwise prompted by her grandfather's actions or her growing bond with Ky. In her burgeoning need to be her own person and doubting the path chosen for her by the authorities she starts to discover what she is really made of. Apparently that's not much. She's gentle, analytical and conflicted which all make complete sense within the realms of the world and her experiences within it but she's also not that engaging. Neither is Ky for all his mysterious ways. The grandfather packs more punch with his rather limited involvement and I found this extremely disappointing. The basis for the connection between Cassia and Ky is flimsy and yet still manages to be thought provoking. He has been fascinated with her (for whatever reason) since they were young but is her interest in him a result of a flawed algorithm or something larger? The tension between the two teens is drawn out well (the attraction decidedly less so) depicting two people that are fated in mathematical and predetermined spheres. But on their own, they are not the most compelling of individuals and that lends itself to weakened emotional resonance. The real power of the story lays in the struggles of the community, that of Ky's family, Cassia's father and those that deal in black market poetry. These smaller aspects are so well constructed and speak so strongly for the world that Condie has built that it effectively camouflages the issues with the central characters. Even with an underwhelming pair at the helm, Matched speaks about the human condition, the importance of art, of choice and the determination of our own paths. A less cluttered culture might make for a calmer, more controlled society but at what expense? It is a question that the author asks the audience in a myriad of ways throughout Cassia's journey, one that will draw out an emotional reaction from the reader. Unfortunately the heat between the central pairing fails to rival that of the societal questions that Cassia begins to question. A thought provoking exploration of strength and persistence within a beautifully crafted dystopian society. I agree on the world building -- it was among the best I've ever seen! the world was fantastic. and all i can think about is the fringe elements that will (hopefully) be explored in the rest of the series. i think what made this pairing for me was the poetry love. Adele, you are spot on about the weak romance. The real story here is in the post-apocolyptic society Condie has created. However, I don't put much stock in Condie's 'sorting' society. Instead of putting my faith in the Matching, as Cassia does, and considering it infallible, I came away with a different understanding: Love is like a train station. If you miss one car, just wait around and another will come. Also, there is little sense of urgency in this story until the very end, and that's piddling. Unlike many other dystopian novels (YA and adult) there is little malice here so I was ultimately underwhelmed.